Location: Clairvaux-d'Aveyron, in the Aveyron departement of France (Midi-Pyrenees Region). Notes: Château de Panat is located on the town of Clairvaux-d'Aveyron in the Aveyron department. 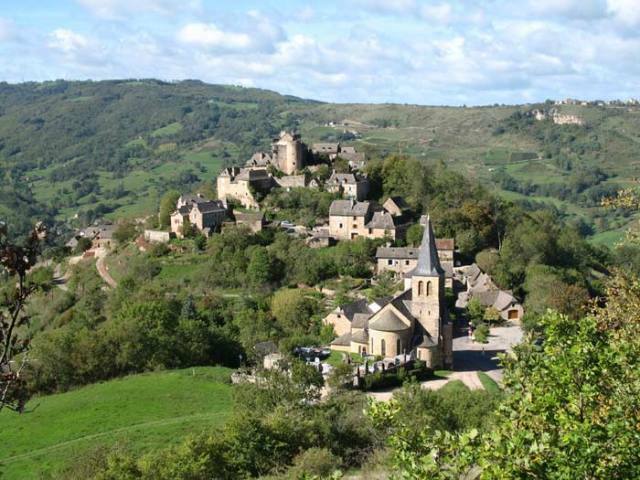 The oldest reference to Panat Castle is in the Cartulary of Conques in 1062, Albouin, son of King Harald of England, stopped there and was received by the lord (senior) of the castle (castrum) of Panat. Foundations, walls and arches of the lower level of the current castle date back to the Middle Ages. However, there have been changes, first in the sixteenth century (including pepper shakers overlooking the valley), and then in the early eighteenth century when a bay with large windows was built between the body of the castle and tower the parish church. A large indoor staircase with wooden balusters was built, large windows were pierced side of the valley, and, shortly before the Revolution, an ornate door of weapons of Panat was inserted into the façade on the jardin4. Around 1890, during the demolition of a house near the Romanesque castle, a Roman door checkerboard from this house was inserted garden. Backed by the castle are the tower and the ruins of a Romanesque church: "The church of Panat, located in the township of Marcillac, district of Rodez, is very old, and its foundation is more than eight hundred years," wrote Count Adhemar in 1808 [William Cousin Baltasard Grainville] the Bishop of Cahors. There apparently it was originally a castle chapel, and later it was extended into a parish church. "(Book of the Parish of Panat, p. 1.). The old chapel and castle ruins were listed historical monument May 6, 1965.